(Ming Pao) When Chen Shui-bian Loses His Firewall. By Nan Fang-shuo ( 南方朔 ). July 31, 2006. When powerful people get involved in illegal activities, they usually have layer upon layer of firewalls to ward off everything. ... This "theory of firewall" can be applied to the corruption cases in Taiwan. For more than one year, there have been a series of corruption cases related to Chen Shui-bian or the Office of the President Most of these past corruption cases involved complicated processes. As long as someone involved in the process accepts responsibility, then that person becomes the firewall. Even if Chen Shui-bian had been connected to the cases, the cases won't reach him. In the Kaohsiung kickback case, the Chen Yu-hao political donation case plus a bunch of insider stock trades from the Office of the President, the former deputy secretary-general Chen Che-nan served as the firewall. The case of the Taiwan Development Corporation and its syndicated loan had the president's son-in-law Chao Chien-ming as the firewall. The SOGO gift voucher case and corporate board meddling cases that involved the president's wife Wu Shu-chen had the president's doctor Huang Fang-yen as the firewall. Because of these firewalls, Chen Shui-bian remained safe. Since these corruption cases do not touch Chen Shui-bian himself, the Democratic Progressive Party people can fool themselves by supporting Bian for seemingly good reasons. First, the so-called "special state affairs expenses" are expenses that are authorized by the President. Its use and verification are spelled out by law. Chen Shui-bian is the principal. This means that there is no firewall and there is no one else to blame. Second, all the corruption cases in the past have firewalls that prevented the fire from reaching Chen Shui-bian. Therefore, when the Democratic Progressive Party supported Bian, they may be shaky on the grounds of political ethics but they can at least come up with a legal defense and some room for self-deception. But the case of the special state affairs expenses is not even legally defensible. If the Democratic Progressive Party continues to support Bian, then they are supporting illegal acts. This means that after this case, if the Democratic Progressive Party people have any conscience left, then they could change their position of supporting Bian. Therefore, the special state affairs expense case could be the final straw that breaks the back of Chen Shui-bian. The approximate outline of the special state affairs case is this: there is a woman Ligi Lee from Taiwan but living in Australia. She travels frequently on business between Taiwan and Australia and she usually stays at the Grand Hyatt Hotel when in Taipei. Her cousin Li Bi-chun is a good friend of Wu Shu-chen and asked Ligi Lee to give her the hotel receipts in order to turn over to Wu Shu-chen to file expense reports. This is obviously "false invoicing." Since Ligi Lee made a photocopy of every bill, these bills formed the basis of the case. After the case was disclosed, the National Audit Office went to the state affairs office of the Office of the President and found invoices from the Grand Hyatt Hotel. Since this case was too obvious, the National Audit Office has forwarded the matter to the Supreme Prosecutors Office. Even though the amount of money involved is not the largest so far, this new corruption case may be fatal to Chen Shui-bian. The President of Taiwan has about NT$50 million to spend on state affairs each year. The verification of these expenses have traditionally been lax. But Chen Shui-bian's problem is that they used other people's receipts to claim expenses, and the reimbursements obviously went into their own pockets. The flow of the receipts went from Ligi Lee to Lee Bi-chun and then from Lee Bi-chun to Wu Shu-chen. No matter whether they went through Chen Shui-bian or not, these receipts went through the Office of the President's state affairs office to the Office of the President's accounting department where they were expensed and reimbursed. Therefore, Chen Shui-bian does not have a firewall. This case obviously involved suspected fraud, falsifying documents and corruption. According to the constitution of Taiwan, the president enjoys the right of immunity and this case cannot be prosecuted against him during his term. But if Chen Shui-bian completes his term or he leaves as a result of a recall or censure, then he will be subjected to the extent of the law. If the case were tried, he may have to go to jail. Therefore, the special state affairs expenses case may be fatal to Chen Shui-bian. They obviously knew the seriousness of the case. So when the case was first revealed, the Presidential Office applied pressure on the principal Lee Bi-chun, the National Audit Office and the Control Yuan. But this case was too obvious, so the National Audit Office had to conduct a detailed audit. The audit showed that out of the NT$47.86 million expensed, NT$36.84 million were irregular or illegal. The Office of the President also lacked the will to cooperate with the investigation, so this case may go further. No matter how this case works out, it will definitely be unfavorable to Chen Shui-bian. Although Chen Shui-bian cannot be touched because he has presidential immunity, his reputation will become worse and worse as this case progresses and his support will fall even further. This will lead to another wave of politics. Relevant Link: Prosecutors to call Presidential Office officials over alleged embezzlement By Rich Chang. Taipei Times. July 31, 2006. Presidential Office public affairs department spokesperson David Lee confirmed yesterday that the salary of Auntie A-Ching (阿卿嫂), the housekeeper for the president's daughter Chen Hsing-yu, is paid for by the Presidential Office. Upon information, Auntie A-Ching earns about NT$25,000 per month for a yearly total of NT$300,000 plus some year-end bonuses. Over the course of the past six years, the taxpayers of Taiwan have spent more than NT$2 million to provide a housekeeper for Chen Hsing-yu and her husband Chao Chien-ming. According to David Lee, Auntie A-Ching is a worker within the system of the Presidential Office, which covers the official residences of the first family. Since Chen Hsing-yu is a member of the first family and she lives in an apartment that is considered one of the president's official residences, Auntie A-Ching works there and is considered a Presidential Office staff member. Comment: This story is a lot more difficult for Chen Shui-bian's defenders than any of the other alleged big corruption cases. The issue is not the legality in some technical sense. The damage is in social perception. The fact is that Chao Chien-ming is a doctor who makes NT$400,000 or so per month and he is known to have these perfectly legal side deals such as the NT$17 million endorsement fee for an umbilical cord blood bank. Notwithstanding his personal wealth, Chao still wants to stiff the taxpayers with the salary of his housekeeper. That is why there is a problem with social perception. Shall a defender of Chen Shui-bian start arguing that this is entitlement in accordance with the law? That will only makes things even worse all around. 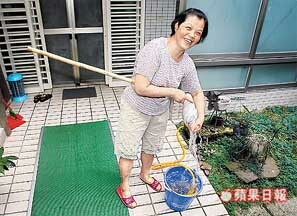 Thus DPP legislator Huang Wei-cher said: "Please don't ask me about this problem. I feel that it stinks. Go and ask some 'deep-green friends' and see what they think (這個問題不要問我好了，我覺得糗斃了，去問一些深綠的朋友，看他們怎麼想。)." 78%: Disgusting! Using public funds for private purposes. The first family must cough the money back quickly.